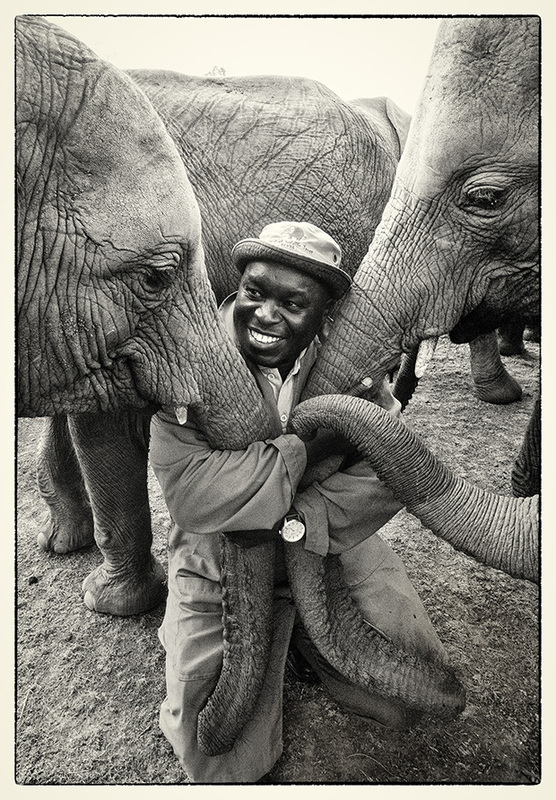 Edwin, Head Keeper of the Nairobi Nursery with elephants Ndotto and Mbegu. You should have heard the rumbles of love as I photographed this group hug. © David Sheldrick Wildlife Trust / Mia Collis. Wild elephants join ex orphans at a waterhole in Ithumba, Tsavo. © David Sheldrick Wildlife Trust / Mia Collis. In 2014, Jacob Putunoi, a young Kenyan boy, helped save an orphaned elephant named Mbegu, who had just barely escaped an attack by humans. Jacob discovered her hiding place while herding his goats, and he brought brought her to Peter Kameru, the Warden at Naibunga Conservancy. Peter protected her from harm until team members from the David Sheldrick Wildlife Trust could arrive and bring her to safety. “I was afraid at first,” Jacob later said. “But when I saw she was small like me, I lost my fear.” He was eight years old at the time. Mbegu was seven weeks. Jacob and Peter are just two of the individuals honored in The Unsung Heroes, the last publication by Dr. Dame Daphne Sheldrick (1934-2018). The book, photographed by Mia Collis, researched by Yolanta Volak, and produced by Angela Sheldrick, tells the stories of people throughout Kenya who accomplished miracles on behalf of elephants. Because of these courageous individuals, who sometimes put their lives on the line to defend orphaned elephants, the DSWT has been able to rehabilitate hundreds of babies whose parents have, in many cases, been killed by people. When they grow up, they reintegrate into a herd in the wilds of the Tsavo Conservation Area. Despite the cruelty that often marked the early years of their lives, the elephants at DSWT are able to heal through the kindness of individual humans. As Dr. Sheldrick writes in her introduction to the book, the mothers, once grown, frequently bring their wild-born babies back to introduce them to the dedicated keepers who reared them in their youth. 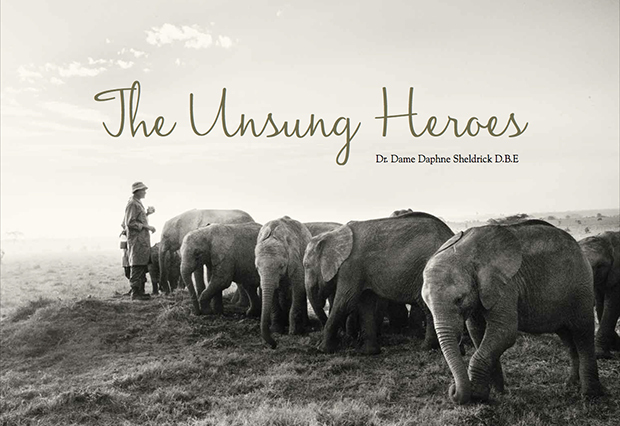 Dr. Sheldrick passed away in April, but she was able to see the final manuscript of The Unsung Heroes before her death. Her daughter Angela, looking back on the day after she lost her mother, told A Beautiful World about an encounter she had at the elephant nursery. A herd of dozens of elephants approached her, a rare event she understood to be an acknowledgement of her grief. In the front was Mbegu, that small elephant rescued in 2014, leading the procession. We asked Collis to tell us about her experience photographing the book. Find The Unsung Heroes here. 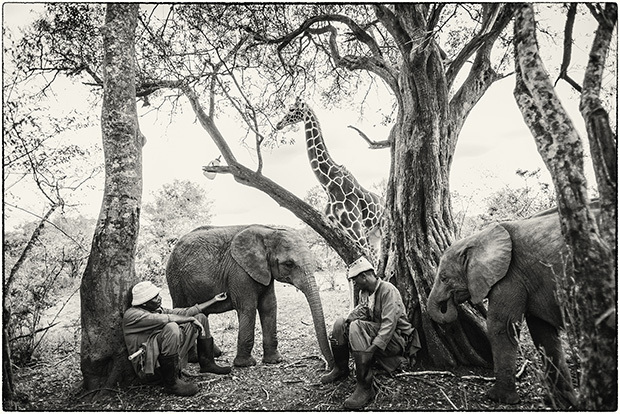 All proceeds from the book go towards helping the DSWT continue their crucial work. How did you first learn about DSWT? How did you spend your days while working on the book? “I spent many early mornings at the Nairobi Nursery. I’d arrive before sunrise and then wait for the keepers and elephants to wake up. I discovered that baby elephants, like humans, snore. It was a beautiful time to shoot. The elephants are just like children: they wake up at the crack of dawn then wait eagerly by their stockade doors for the keepers to wake up and let them out to play. “The book focuses on brave individuals who went to great lengths to save an elephant before the DSWT actually got there. Many of the ‘heroes’ live in far and remote places of Kenya. The research writer Yolanta Volak (Yoyo) and myself were assisted by the DSWT funded VET teams, who knew those areas of Kenya well and were the primary responders to the rescue call. “Our days were spent journeying to the location. I would photograph the landscape, which was key to explaining not just the remoteness of the area but also how varied and beautiful Kenya is. We would spend about a day with each subject in the spot where the elephant was rescued. I’d take their portrait in their own environment and Yoyo would record their story. A typical scene at the Nairobi Nursery with Kiko the orphaned giraffe, who tags along sometimes. © David Sheldrick Wildlife Trust / Mia Collis. Did you get to know any of the keepers? “I got to know many keepers working at the Nursery and the reintegration units during the course of the book. They would watch out for you in the bush as well as being the link between the elephants and you. They would translate the elephant social interactions into human language. This knowledge about the characters and their individual quirks became invaluable in understanding and then photographing the elephants for the book. Did you witness any human/elephant interactions that stood out to you? “Quite often in Ithumba and Voi, the orphan herd are joined by ex-orphans or wild elephant herds. The DSWT welcomes this integration as it helps with the transition back into a wild life. On this particular shoot day in Ithumba, we were joined by a completely wild herd. Full adult elephants make a large seven-year-old elephant look like a baby again. The keepers intelligently distanced us humans to the other side of the orphan herd, and humans, orphans, and wild elephants walked together that morning. 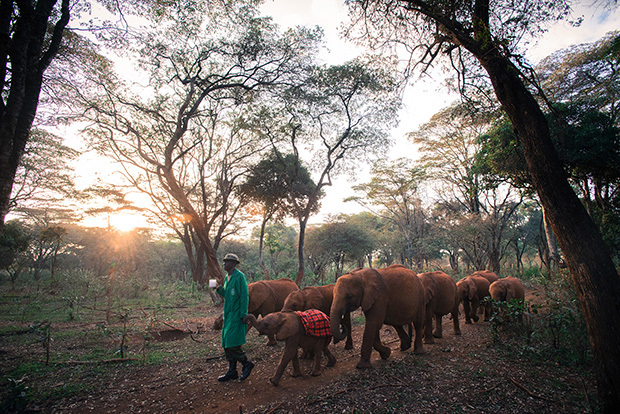 Julius, a Keeper at the Nairobi Nursery, leads the herd one early morning. © David Sheldrick Wildlife Trust / Mia Collis. Did you personally bond to any of the elephants? What is it like to physically stand in the presence of these animals, outside of a captive environment? What was it like to see them feel truly safe and free? 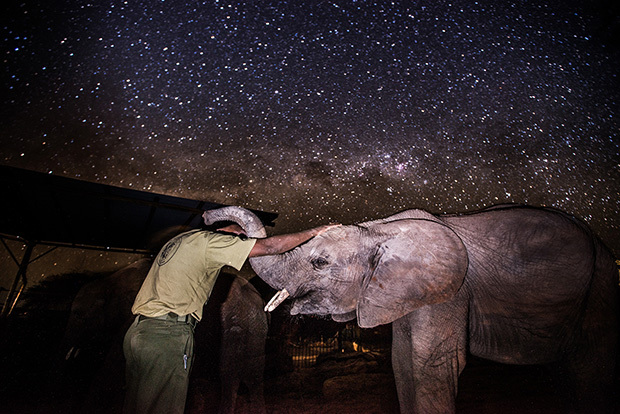 Benjamin, Head Keeper of Ithumba Reintegration Unit, bonds with orphan Boromoko before bedtime. © David Sheldrick Wildlife Trust / Mia Collis. Might you share one moment you’ll never forget? 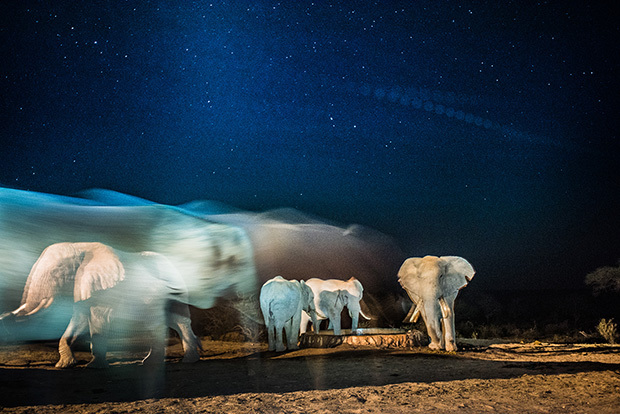 “In DSWT’s Ithumba Reintegration Unit in Tsavo, I wanted to photograph the elephants going to sleep at night, under the stars. As well as being technically difficult, I had to get an elephant subject who would stay still for a long exposure without being startled by a torch, walking away, or trying to push me over. It was a tall request for the DSWT Keepers. 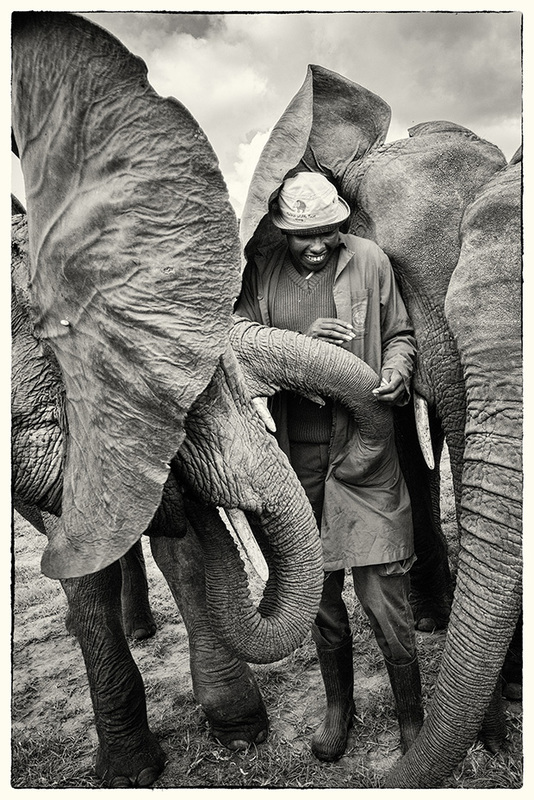 Evans, a keeper at Umani Reintegration Unit, had Acacia seeds in his pocket, and the elephants certainly wanted them too. © David Sheldrick Wildlife Trust / Mia Collis. What will you remember most about her? How can we help support DSWT and the work they do? “Anyone and everyone can partake in the orphaned elephant foster program by adopting an orphaned elephant for a year. This is how they fund the orphans project, with many people around the world choosing an elephant to foster. It is a minimum of US $50 a year, but you can foster for any amount over and above that too. It is such a worthwhile thing to do, and it makes a wonderful gift. “In today’s crazy world, it is special to be able to give something like this—so novel and at the same time educational, all the while supporting such a worthy cause. Another way to support is directly through the David Sheldrick Wildlife Trust charities in either Kenya, UK, or the USA by making a donation. This can be done through their website, www.sheldrickwildlifetrust.org, or directly through their 501 (c) 3 in the USA , DSWT UK or DSWT Kenya. All details can be found on the Trust’s website. Keeper Peter watches over the Nairobi Nursey heard early morning. © David Sheldrick Wildlife Trust / Mia Collis.